The Boxer's body is compact and powerful. The head is in proportion with the body. The muzzle is short and blunt with a distinct stop. The nose is large and black with very open nostrils. The jaw has an under bite. The eyes are dark brown. The ears are set high, either cropped or kept natural. When cropped they are trained to stand up on the head, tapering to a point. When left natural the ears are thin, falling forward, laying close to the head. The neck should be round, strong, and muscular, a without dewlap. The muscular, front legs are straight and parallel when viewed from the front. The back legs are well muscled. The tail is set high and usually docked. The AKC severely penalizes a natural tail, while most of Europe has outlawed this practice. Dewclaws are usually removed. The short, smooth, close-fitting coat comes in, fawn, brindle, tan, mahogany, black often with white markings. 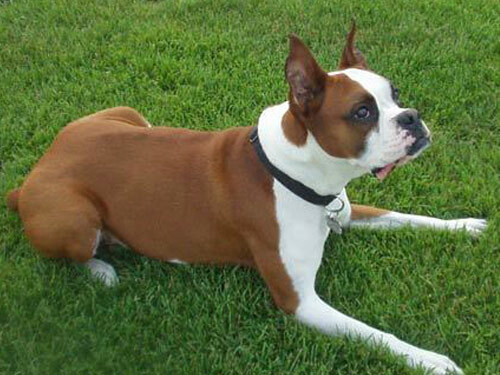 Boxers also come in a white coat that cannot be registered with some clubs. Some major concerns are cardiomyopathy and other heart problems, sub-aortic stenosis, and thyroid. Can be prone to skin and other allergies. Sometimes prone to epilepsy. From age eight on they are more likely to get tumors than other breeds. Prone to cancer. Prone to arthritis, hip dysplasia, back and knee issues. These dogs may drool and snore. May have excessive flatulence, especially when fed something other than their own dog food. Some white Boxers are prone to deafness. Boxers will do okay in an apartment if sufficiently exercised. They are fairly active indoors and do best with at least an average-sized yard. Boxers are temperature sensitive, getting easily over heated and chilling very quickly. The Boxer was developed in Germany in the 19th century. The Boxer's ancestors were two German mastiff type dogs, the Bullenbeiszer and the Barenbeiszer. They were later crossed with the powerful ancestors of the Mastiff and Bulldog. Early Boxers were used for dog fighting, bull baiting, cart pulling, cattle dogs, to round up livestock and to catch and pin wild boar and bison until hunters could arrive. They later became popular theater and circus dogs. The first Boxer studbook was started in 1904. Up until then the dogs varied widely in looks and size. The Boxer is known for the way it uses its front legs to bat at its opponent, appearing to be boxing with the front paws, most likely giving the dog its name. Some of the Boxer's talents are watchdog, guarding, police work, military work, search & rescue, competitive obedience, schutzhund and performing tricks. Breeders are breeding two types of Boxers, the German Boxer and the American Boxer. The German Boxers have bigger heads and are generally more muscular than American Boxers.